Classes are taught by certified Baptiste Teachers who have trained and studied with Master Yogi Baron Baptiste. His best-selling book, “Journey into Power” is the blueprint for these classes. In a Vinyasa class, postures and sun salutations are linked together through breath to create a meditative and invigorating flow. Taught in a 90 degree heated room, muscles soften and become more pliable and also the cardiovascular effects of the flow are increased. Classes are challenging and transformative and are open to all levels of practitioners. There is a strong emphasis on conscious breathing, to anchor students into the present moment. Be prepared to sweat like you never have before! 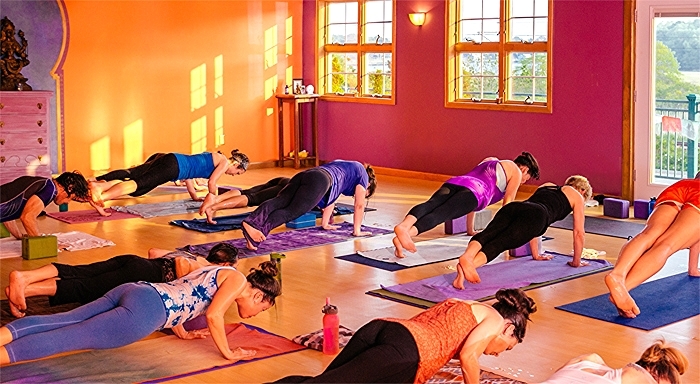 Classes are taught in a warm room and in a spiritually uplifting environment. Classes are taught in a warm room and in a spiritually uplifting environment. The Foundations of the Baptise flow are explored, making this a great class for new students or students who would like to get back to the basics. Students are encouraged to focus on ujayi breathing, udiyana bhanda (engaging the core), and staying in the present moment. A monthly workshop for students new to the Baptiste Power Vinyasa. Classes are taught by teachers that are learning how to teach Baptiste style power vinyasa and may not be certified teachers yet.